When have you ever been in any school where a teacher has encouraged you to scream? That is exactly what happened at Assumption Catholic School one September afternoon at our School Spirit Pep Rally! It all started with the Class of 2011 building excitement by visiting classrooms in the days leading up to the rally. They gave short animated hints about what was to come. You might have heard: “I’m going to be there. Are you going to be there?” with no further information. By Friday many students had solved the mystery of where they should be. 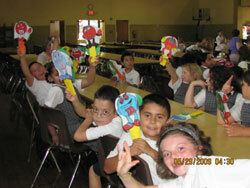 This led to the start of a highly -charged gathering of all classes, kindergarten through eighth grade. You might be thinking that it was a sports oriented pep rally, but it wasn’t. Students were there because they are excited about being part of the ACS community. Each class was announced and all other classes cheered them on as if they were the stars of a team. Following this every new student came forward and introduced themselves. These students were given welcoming cheers that made them feel right at home. As the rally continued, Mrs. Shumny touched on some of the things that make a good school family. One of the main things she addressed was that coming to school prepared and ready includes a proper uniform. 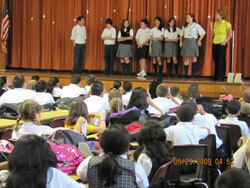 Several students were asked to come to the stage to model their appropriate fall/spring and winter uniforms. These students also received many cheers from their schoolmates and teachers. After all of the enthusiastic cheering, may have left with strained vocal chords, but all had a feeling of school pride.